^ Hoffman, Charles Fenno (1839). Wild Scenes in the Forest and Prairie. 1. London, England: Richard Bentley. p. 31. ISBN 9780665588648. OCLC 18663880. http://books.google.com/books?id=JHoEAAAAQAAJ. ^ The Magazine of History with Notes and Queries. 4. New York, New York: William Abbatt. (1906). p. 282. OCLC 1756447. http://books.google.com/?id=x_AOAAAAYAAJ. ^ Coppée, Henry, ed (1900). The Classic and the Beautiful from the Literature of Three Thousand Years. 1. Philadelphia, Pennsylvania: Carson & Simpson. p. 220. OCLC 334758. http://books.google.com/?id=fL8CAAAAYAAJ. ^ Ingersoll, Ernest (1893). Rand McNally & Co.'s Illustrated Guide to the Hudson River and Catskill Mountains. Chicago, Illinois: Rand, McNally & Company. p. 19. https://books.google.com/books?id=TRECAAAAYAAJ 2015年1月6日閲覧。. ^ Jacobs, Jaap (2005). 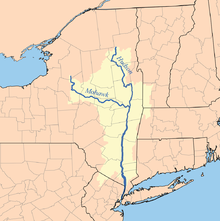 New Netherland: A Dutch Colony in Seventeenth-Century America. Netherlands: Brill Publishers. p. 11. ISBN 9004129065. OCLC 191935005. http://books.google.com/books?id=Uex2budtSOUC.